Elements help you understand how customers have configured your product, so you can ensure each implementation is setup for success. As your customers setup your product, they likely have to work through a handful of tasks before they are really ready to experience its full value, right? For example, take Slack. 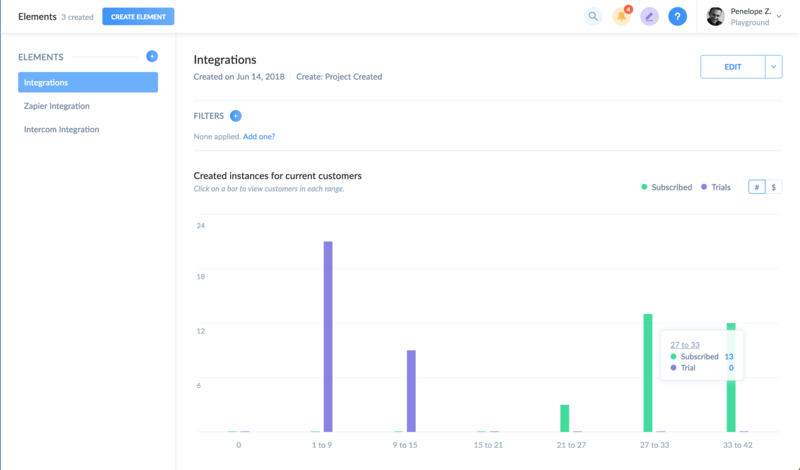 Slack's onboarding process asks you to invite team members, configure your Slack subdomain, create some channels, and enable some initial integrations. If the user does all these things, Slack knows they are MUCH more likely to experience Slack's value, and thus pay for the product. Fun fact! You can aggregate customers by MRR here, allowing you to show the impact a specific feature 'state' has on the customer's willingness to pay. Interesting stuff, right? But, Slack has lots of integrations, and creating an Element for each and every one may be a bit unwieldy. 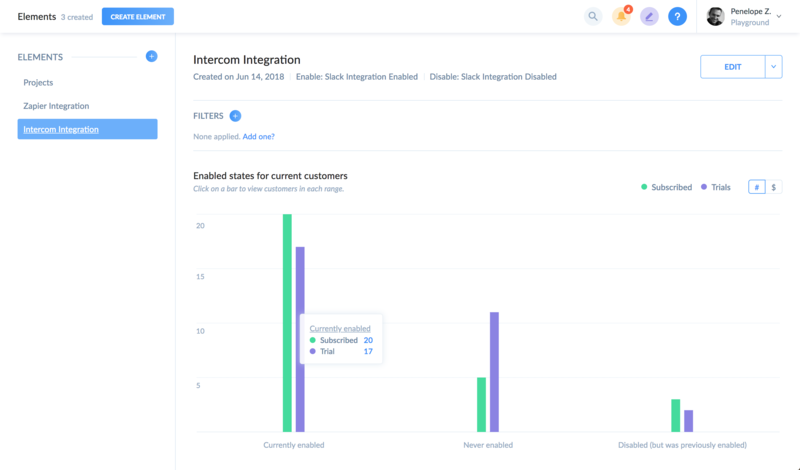 Instead, let's assume Slack would rather track the number of integrations enabled by the customer (and which ones they are) rather than if a specific one is enabled. Vitally can help here too! Note: We recommend only setting up Elements for features that 1) are critical for the customer to use a handful of times and 2) are mostly used during setup, and then sporadically after that. If the customer may create hundreds or thousands of instances of the feature, an Element won't offer much value, as it works best for smaller datasets. 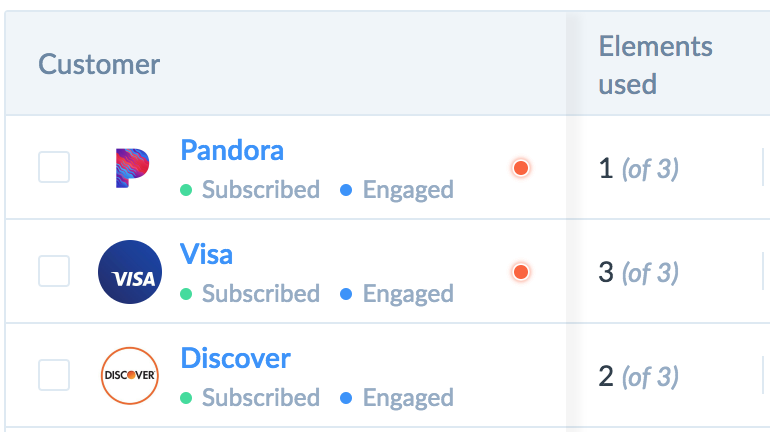 Instead, focus on our default event metrics to measure these more frequently-used features. You can of course use this column in filters and Indicators. For example, one potentially helpful Indicator is one that flags new customers who have failed to use a majority of Elements. Since your product is fresh in these customers' minds, but since they've failed to experience its full potential, some human outreach may be warranted! Elements are essentially the individual 'building blocks' that compose your overall product. In Vitally, we'll track which customers have enabled/used each Element and will also provide helpful histograms showing Element usage across your entire customer base. To determine which Elements you should create, walk through your onboarding process and list out the exact features and options you'd want to ensure every new customer experiences. However, focus on 'foundational' features - don't include features the customer is expected to use in a normal session, as Elements won't offer much value for larger datasets. The goal here is to help you understand how your product is implemented, and not so much if common features are used on a recurring basis.